Select Option 4408 - 8 Fr. 4410 - 10 Fr. 4412 - 12 Fr. 4414 - 14 Fr. 4416 - 16 Fr. 4418 - 18 Fr. 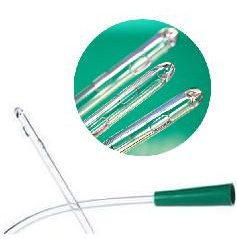 Self-Cath Plus is a hydrophilic catheter that activates immediately with exposure to water to make lubrication fast, easy and clean for catheterization. Includes an unovative and uncoated Grip Zone area for total control. Latex free. The Male Self-Cath Plus comes with a funnel end. Lofric hydrophilic have smaller holes and thicker coating, both may be better to avoid damage. But Lofric have sharp punched holes, these have rounded edges. Mildly annoying is utter lack of instructions for wetting the coating before use. 30 sec in warm water works fine.